This is a really good recipe – and very easy to put together. What will surprise you is that the sauce is made from leftover cola – you won’t taste it but it will tenderize the meat and give a really nice, sweet flavor.You start the ribs in your slow cooker and finish them on your grill, using the sauce – try them soon and let me know how you liked them! 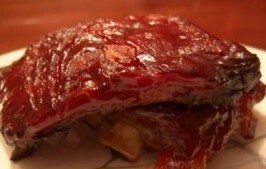 With a sharp knife, separate the rack of spareribs into individual ribs. Combine pickling spices, salt, and water. Cook until ribs are tender, but meat not separating from the bones, about 6 hours on low setting. Remove ribs from crock-pot, discarding liquid, and arrange in a shallow baking pan. Combine brown sugar and dry mustard, mixing thoroughly. Cover pan and refrigerate for 12 hours. Combine ketchup and cola, mixing until smooth. Finish ribs on the grill or under the broiler, watching carefully for flare-ups, until browned and warmed through.